Things I've been reading: I plan on having another YA Lit book round up in a week or so when I finish the others in my library book pile, but I had a lot of time to kill on Monday and this book kept me occupied while I sat in a golf cart for literally over five hours. 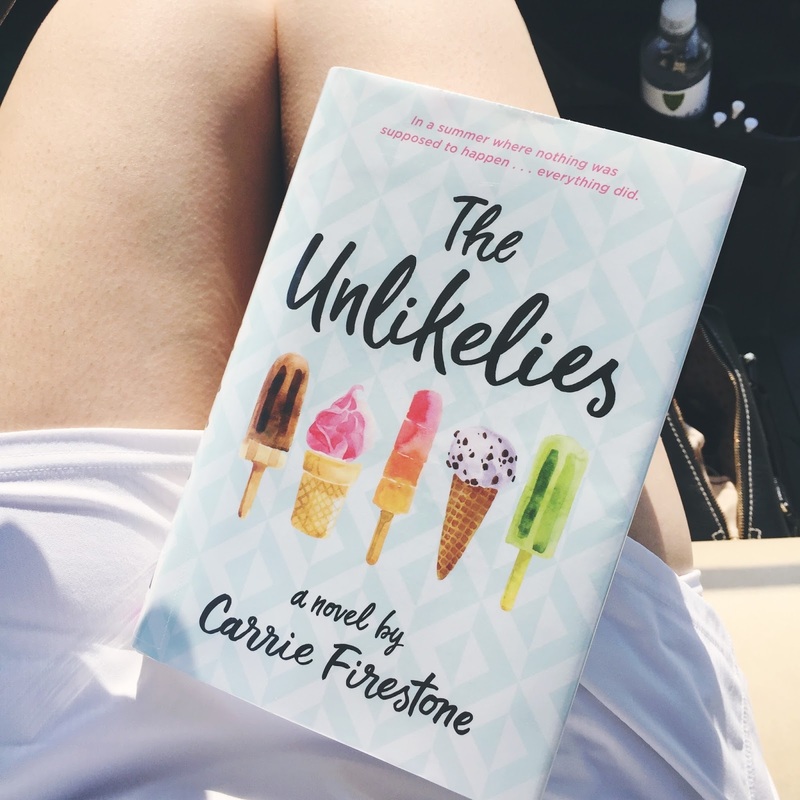 The Unlikelies by Carrie Firestone was a book that I, admittedly, picked out because the cover is adorable and super aesthetically pleasing. How adorable is that pastel blue cover and watercolors of ice cream cones and popsicles? The Unlikelies follows Sadie, deserted in the Hamptons for the summer by her best friend who's coaching a camp across the country and her now college bound ex-boyfriend. She's destined to spend her summer working at a farm stand. One day on the job, a drunk man leaves his baby unattended in the car and Sadie shows concern and tries to help. The man assaults her and the entire thing is caught on video. This video went viral and Sadie became internet famous for saving that baby's life, as the father had kidnapped the child from its rightful mother. Sadie meets four other "do gooder" teens at an event recognizing their achievements and they form a bond. Gordie, Val, Jean, Alice, and Sadie spend their summer as The Unlikelies, using their free time to not only help their community and the world but to help each other. When I'm reading, I read for characters. I love well-written characters with great inner monologues. I love ensemble casts with well-developed secondary characters that have a purpose and depth. This book was one of the few that didn't disappoint on a secondary level. If anything, this book's secondary characters have just as much depth as Sadie herself. I don't want to spoil anything about them, but they're an interesting bunch and this book definitely tackles very topical issues (racism, the opioid epidemic, chronic bullying online). I wasn't sure about this book when I started it, but it only took around 40/50 pages for me to get to the point where I didn't want to put it down. Things I've been watching: I've watched more Law and Order: Special Victims Unit (or as I like to call it, SVU, pronounced Suh-Voo to annoy my mother) in the past two weeks than I think I have in my entire life. I don't much for the regular Law and Order or whatever that criminal intent one is. I want Olivia Benson and Elliot Stabler and Ice-T, whose name is not Ice-T in the show obviously, but I just love saying his name!!!!!! This show is addicting. You watch the first two minutes of an episode and you have to fully commit to the whole hour. One does not just stop an episode halfway through, you must see it to completion. I feel like I haven't talked about new YouTubers that I've been watching in a while. To be quite honest, I haven't started watching a lot of new ones. I'm kind of picky when it comes to who I watch on YouTube. I could easily binge watch endless segments from Late Night TV Shows, but I can't binge watch random videos from other YouTubers. If I'm going to introduce myself to a new content creator, I need time to sit down and watch a lot in a row so I can figure out who they are. Basically, I need to want to befriend them before I spend a lot of time watching their videos. Chris Klemens, if you're reading this, I WANT TO BE YOUR BEST FRIEND. You might have seen his videos in your suggested videos. Previously a New York based series, Chris had videos that were always something along the lines of "Talking to Strangers About ______" and would literally just talk to strangers on a street corner about whatever topic he was covering that week. It's hilarious and cringe worthy and it took me a while to get over my second-hand embarrassment. I could never do what he does and he's just so funny and sarcastic and seriously, Chris, I know you're in LA now but like...friends? Forever? Please? I don't even know where you should start when it comes to watching his videos. Just click his name any time I mention him above to go to his channel and some of my favorite videos. Things I've been consuming: My Target stopped selling this which is REALLY MESSED UP, but luckily Wegmans has my back and I have my lemonade coconut water back in my life. I'm not really sure what I can say about this. 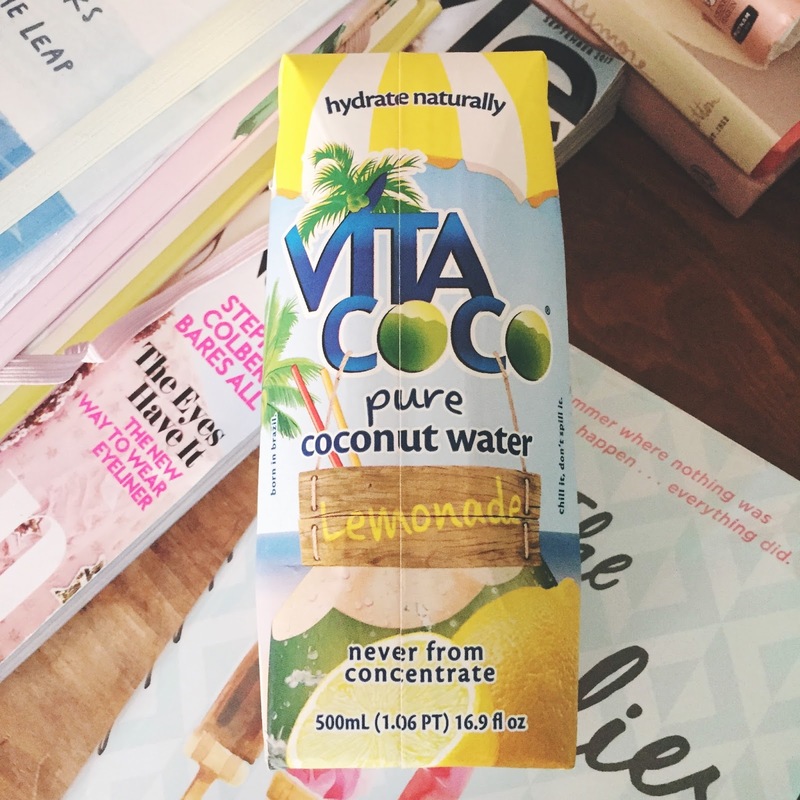 Regular coconut water tastes like soapy water to me, so at least this lemonade version makes it taste like citrusy and sour soapy water. In all seriousness, I actually do like this and it's fun to drink when regular water is boring me. Things I've been listening to: Y'all, Aly & AJ are BACK. Ten years later and my favorite sisters are killing the game with their new single "Take Me." Highly recommend listening to this on repeat. I also finally decided that it was time to listen to Maren Morris. I don't like country music, blah blah blah, but she reminds me of Kacey Musgraves and she's cool as heck so you know what...I'm just going to continue listening to whatever I feel like it. Maren Morris' entire album is just straight fire and incredible, but if you're picky about not listening to country music, just let yourself get all emotional to "Once" and "I Could Use a Love Song" and then see if you can resist giving the rest of the album a shot. Adding the Unlikelies to my reading list! I've been on such a YA kick lately. I hope you like it! I thought it was really cute and a breath of fresh air! Um, hello, Aly & AJ are back? You may have just changed my life!!! YESSSS, they're back and they're already killing it! Sooooo good.